Dorval’s TOP POPS® CHEWY TAFFY CANDY POPS have been reformulated with enhanced flavors and a softer texture. Each pop now has a UPC on the stick for individual piece sale. “With the growth of the line over the past many years, it was time to refresh the Top Pops® brand and expand the already vast appeal the pops have in the market”, says Roberta Cappel, President. The pops are still packed in 48ct displays, but the new boxes are slightly larger for better visibility on the shelf. Each box also contains 12 slotted pop holders for creative merchandising. Graphics are updated with bold new packaging. TOP POPS® are available in 5 of the same flavor varieties as before- Blazpberry® (Red & Blue Raspberry), Strawberry, Watermelon, Strawberry/Lemon and Assorted which contains all four flavors in one box. Pina Colada and Peach are not currently included in the assortment at this time but new flavors will be coming in the future. The NEW TOP POPS® are also GMO-free. The TOP POPS® are packed in 24x48ct cartons and have brand new item numbers and UPC’s. They are available for shipment now! 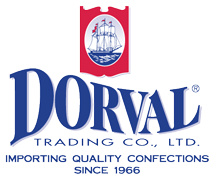 Dorval Trading Co., Ltd., is an importer of an extensive range of high-quality confectionery products from major manufacturers around the world. Dorval has grown into a significant presence in the confectionery and specialty distribution arena. Dorval celebrated their 50th anniversary in business in 2016.